DJI says farewell to the GoPro? It was announced today that DJI has joined the Micro Four Thirds standards group this means DJI is serious about camera manufacturing. The Micro Four Thirds system (MFT) standard was created by Olympus and Panasonic in 2008 but has since attracted a number of supporting members including Blackmagic, Zeiss, Cosina, Fujifilm, Leica and many more. 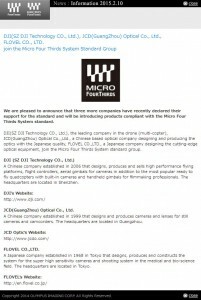 DJI is the first multicopter manufacturer to join the group. 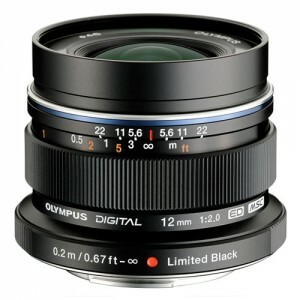 Some of the most exciting mirrorless cameras, especially for video are MFT including the Panasonic Lumix GH2/GH3/GH4, The Olympus OM-D and a number of Blackmagic cameras. You’d imagine that DJI plans a fully integrated camera similar to that on the Inspire with a Micro Four Thirds mount. We’re self confessed MFT fanbois. We’re huge fans ourselves of Micro Four Thirds gear, it’s the best supported mirrorless standard with a wide variety of lenses and camera bodies to choose from. If you follow us on Twitter you’ll have heard us rave about the Olympus OM-D E-M5 II and we’re also jealous of Simon Beer and his new cine lens set. Our dream camera is something slightly bigger than the GoPro with a Micro Four Thirds mount, at least 50 FPS recording at 1080p (4K is a bonus) at a bitrate of at least 50Mbs, with a stabilisation system like the Olympus. Surely that’s not too much to ask? There’s already a big business in GoPro replacement lenses to get rid of fisheye but such lenses are often fairly poor optically and marked up in price by often insultingly large margins, it proves however that users, both commercial and hobbyist, want choice, having interchangeable lenses provides that choice. DJI doesn’t even need to manufacture every component in making a camera, they could choose an existing sensor from the likes of Sony and there are already fast lenses available from both Panasonic and Olympus that provide detailed, sharp, wide views. The only downside we can imagine is that DJI will likely tie any camera into its own flight controllers which likely means we’ll never get to try one, with DJI’s poor software QA we’d trust Vladimir Putin before DJI’s A2 controller.